Pretty Things: 2nd Cup of Bead Soup with Lutka and Co.
You can read more about the Cup of Bead Soup project by clicking here. Today I'm going to show you the second piece of jewelry I made with handmade lampwork beads by Lutka and Co.
And chose the ones with yellow in them. Yellow is a tough color for me to work with because I look horrendous in yellow, and have you found yourself not making jewelry in colors you don't rock in? 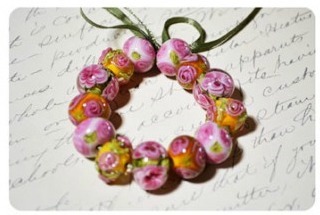 So here I have these beautiful floral beads in pink and yellow, and I'm trying to decide on the contrasting color. Well what DO I look good in? Purple! 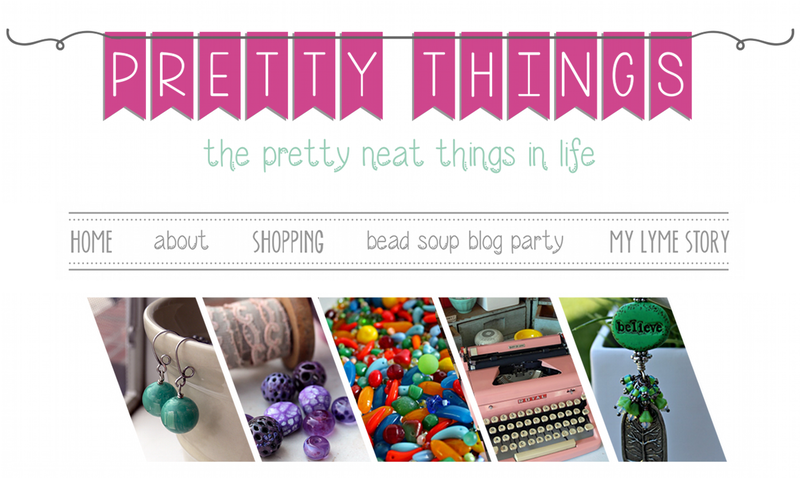 I had this small bag of purple keshi pearls (oh how I love that shape!) and a silver bead I'd been hoarding that reminded me of folded paper lanterns. I know, I know -- I mixed bright silver with Thai and oxidized -- but I didn't think it was too distracting and on the wrist, it worked. It doesn't always work -- but I think it did this time. Some of the beads had raised details, while some were melted in. I liked that. This is definitely a "touch me" textural bracelet, so having everything down to the glass have a touch factor really made this a treat. Yes, this is one of my more traditional styles. However, I did try to shake it up a bit with the addition of the textured pearls rather than crystal or smooth gemstones, and I went a little asymmetric. Asymmetry, while one of the styles of jewelry I admire the most, is not the easiest for me to do, and in jewelry of this style, TOO much asymmetry would hurt the eyes, I think. You can visit Lutka & Co. by clicking here for the store and and here for the blog. 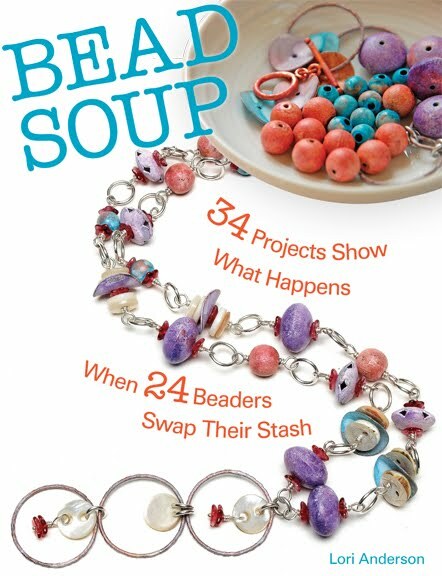 Stay tuned through the month of September for more, and visit the Cup of Bead Soup Page for past creations! It's a beautiful bracelet Lori, the different colored silvers and all. You did well with the yellow Lori. I too dislike yellow and challenged myself recently to create something with yellow as the foundation. Colour challenges are good for our creative souls. A beautiful piece! I love combination of purple and yellow which reminds me of wild iris one might find along the side of a country road. I have a reddish skintone from rosacea so I steer clear of anything red or orange. But any other color is fair game for me. You have a great talent for combining star pieces (you know pieces that need to stand alone because they're so special) in one design. Seems the yellow has now taken a back seat...what a lovely shade of purple...fantastic job! How about glass beads that change color...depending on the light source. 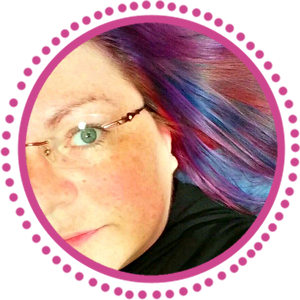 I have some that are a nice light violet and in different lighting change to a pale blue. Or is it that they are pale blue and change to a pretty violet..either way...I'm stuck..,I don't want people thinking I don't know to match up colors. I guess I'll do a pale blue/purple design... that will work in any light....so you'll get two looks for the price of one. 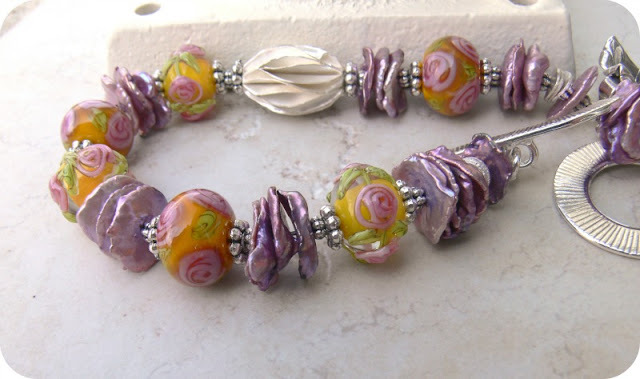 Love the purple keshi pearls, just what the yellow lampwork beads needed. This is gorgeous!! The colors look fantastic! Yummy! Love the colors you mixed together! Beautiful! Love the way you designed the entire piece. You did a great job. I actually love yellow. And I love the colors you put together in that bracelet. You amaze me. That is one gorgeous bracelet and I love how you trust your instincts to know what works. It is really beautiful! (And p.s., yellow is the hardest color for people to wear. I look awful in it, too, and in all it's forms like orange, mustard, khaki or rust and even a camel hair coat I once tried to wear. You rocked that bracelet! I would have never thought to add purple. its awesome! I love this bracelet. The colours are just perfect together! Pretty. 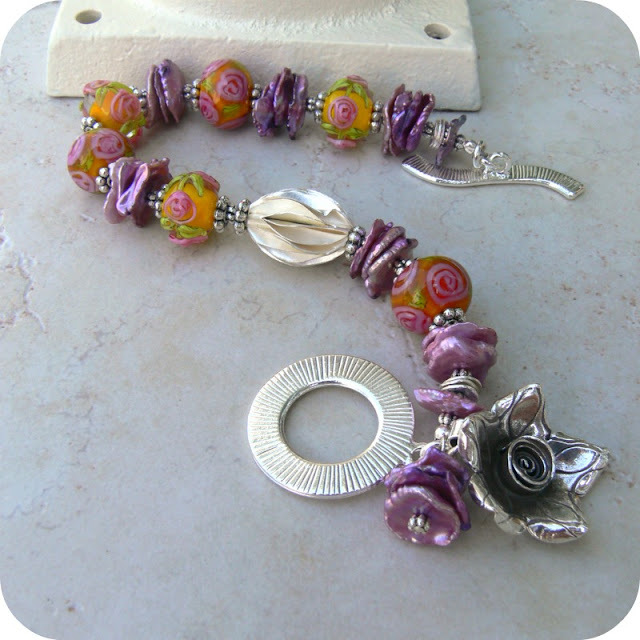 Yes indeed, it is one of that jewelry pieces you want to touch and touch and play with - it is wonderful and appealing to the eyes and everything is well balanced - the different silver, the lampwork and the keshi beads. Color and shape - I love it. Have a sunny day dear Lori, I am looking forward for a wonderful bead soup ... cannot await it to see what you have done with my beads. Whatever you did - I am sure I will be tres enchantée ☺. 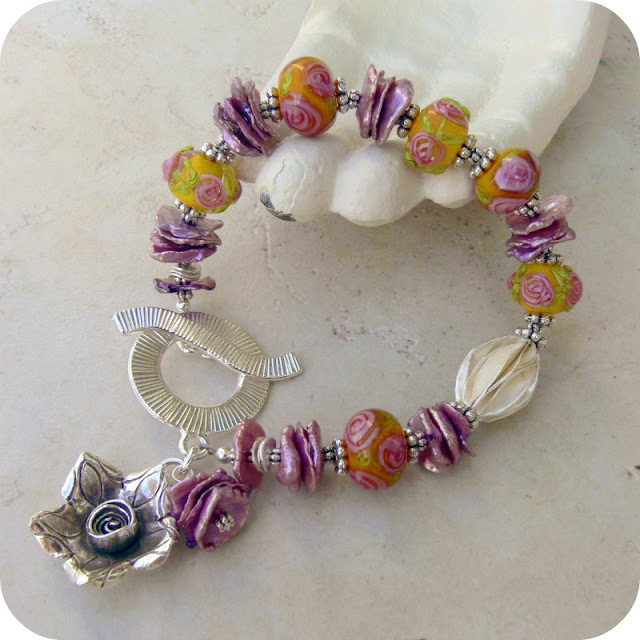 I love everything about this bracelet Lori, the colours, style and especially the toggle and clasp. Yellow is a colour I wouldn't normally wear or choose for jewelery even though I think it's such a cheery colour. Beautiful! I love the colors. I didn't even note that the silver was in different tones until you pointed it out; it flows together that smoothly. I also really like the way you stacked the purple keshi pearls, to me they look like the petals a flower that have dropped off and nestled together. Lori the bracelet is Gorgeous! I love those pearls, the lantern shaped bead and just everything! WOW!!!! Oooh, pretty! Beautiful bracelet and color combination. I love the silver bead, set asymmetrically and the flower dangling from the toggle. OMG That bracelrt is to die for. Those colors are dreamy. Gorgeous bracelet, Lori! Love the textures and colors! Beautiful Lori- I love all of the texture. Gosh - this is great art. I love this piece - the way you put it together is just amazing work!! Love it love it love it. Those purple keshis are absolutely beautiful! Stunningly - I love the color combination, it is so awesome. Lori you have created a beautiful bracelet and done the beads proud. The textures, and silver elements all work so well together. You have truly enhanced handmade glass beads that are beautiful on their own into a work of art that is complete and stunning. Very very nice. I never use yellow either for the same reason (brown falls into the same category for me). What a surprise that you chose purple:) I think you made another fantastic piece. Lori, this is truly gorgeous! Linda's lampwork is exceptional and I love how you combined them with the keshi pearls and added the silver focal. Love it!! Lori, this is the prettiest bracelet! And I love the "paper lantern" silver bead. It SO works with the design! Found this post from "you might like" suggestion at the bottom of a post -- Wow! 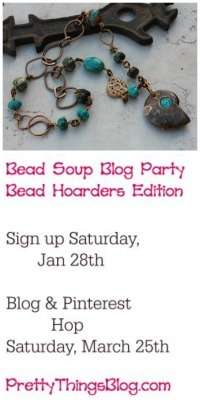 incredible jewelry -- beautiful!